"A crisp and crunchy salad that complements any summer picnic or barbeque." Whisk olive oil, vinegar, lemon juice, salt, and pepper together in a bowl until dressing is smooth. 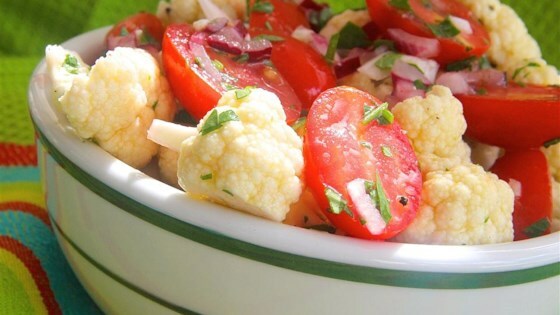 Mix cauliflower, red onion, parsley, and garlic together in a large bowl. Drizzle dressing over cauliflower mixture; toss to coat. Gently fold tomatoes into salad. Chill salad in refrigerator up to 3 hours before serving. I used cilantro instead of parsley and worked out great! I really enjoyed this recipe. I added some black olives for an additional flavor. Next time I might blanch the cauliflower for a few minutes to soften the veggie. Great summer picnic dish. This is a tasty and colorful way to replace a dinner salad. I found it could marinate for up to 48 hours in the fridge. Great winter salad side. I made this without garlic and parsley but it was very very good. Will add garlic and parsley to the leftovers along with our homemade pickled green beans. This is a delicious salad. The only thing I changed was I roasted the cauliflower with no oil to bring out a nutty flavor to the whole thing. Not necessary but worth the extra bit of time.